Background: A number of recent studies have shown that a specifically designed odor inhaler containing various scent compositions has the ability to decrease blood pressure, heart rate, and cortisol levels. Similar results were found for the reduction of chronic pain or the enhancement of selective attention and concentration. Objective: This paper follows up on these findings and investigates whether a specially designed inhaler (‘Energy') is capable of temporarily increasing blood oxygenation. 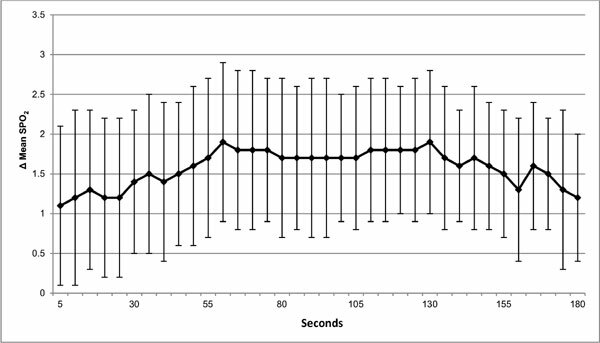 Method: A prospective, controlled experimental study involving standardized breathing cycles was run to compare normal, deep breathing with breathing through an odor inhaler. Results: The difference in blood oxygenation between normal breathing and odor inhalation was very large (d = 2). It lasted three times longer than that of normal breathing. The effect was shown in all individuals and did not abate after repeated use. Conclusion: Blood oxygenation can be increased over and above the effect of deep breathing when using this odor inhaler. Keywords: AromaStick®, aromatherapy, blood oxygenation, essential oil inhaler, pulse oximetry, SpO2. Keywords:AromaStick®, aromatherapy, blood oxygenation, essential oil inhaler, pulse oximetry, SpO2. Abstract:Background: A number of recent studies have shown that a specifically designed odor inhaler containing various scent compositions has the ability to decrease blood pressure, heart rate, and cortisol levels. Similar results were found for the reduction of chronic pain or the enhancement of selective attention and concentration.